Roasted Pumpkin Seeds — my.life.at.playtime. We are loving the fall weather right now. Well, fall for us is anything below 70 degrees! But we are loving it nonetheless. We had a weekend full of homemade soup, pumpkin muffins, and roasted pumpkin seeds. 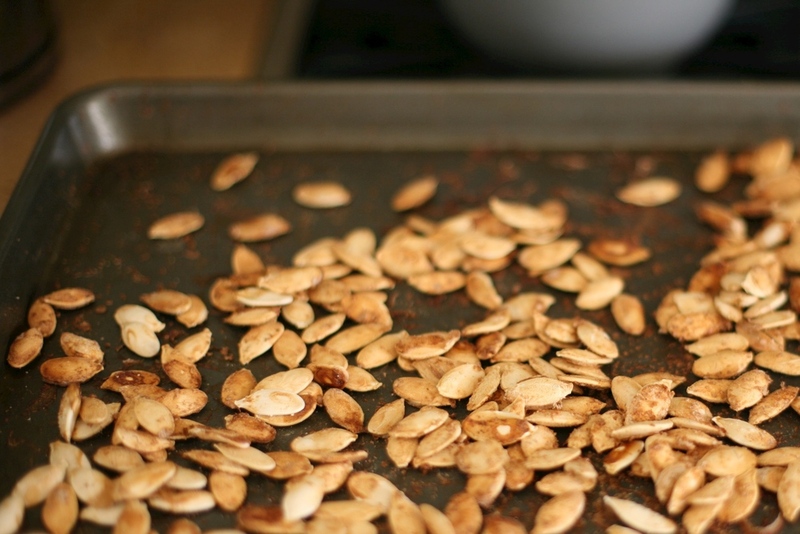 This is, in my very humble opinion, the BEST recipe to roast your pumpkin seeds. The hardest part is just extracting those seeds from your pumpkins! But never fear, children LOVE that part. The size of your seeds will of course depend on the size of your pumpkin, and the amount of seeds will also very by pumpkin. Once you have collected all the seeds from your pumpkin, rinse them in water and remove any pumpkin that is clinging on to the seed. In a separate bowl combine the Worcestershire sauce and garlic salt. Combine the seeds into the mixture and lightly coat the seeds. Preheat the oven to 275 degrees. Lay your seeds on a baking sheet and transfer to the oven. After about 25 minutes take a spoon or a fork and move the seeds all around, most will flip over and you'll see them start to brown. Let them roast for another 25 minutes or until they are all a nice dark golden brown. Then eat and enjoy!